Oxford University Press, USA, 9780192802460, 382pp. A startling amalgam of Zulu war-cry and Sherlock Holmes, of practical tips on health and hygiene and object lessons in woodcraft, Scouting for Boys (1908) is the original blueprint and inspiration for the Boy Scout Movement. An all-time bestseller in the English-speaking world, second in its heyday only to the Bible, it is one of the most influential manuals for youth ever published, known and loved around the world. 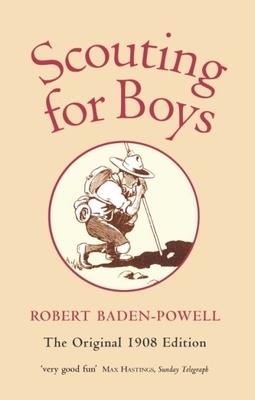 Including all of Baden-Powell's original illustrations, this new critical edition of Scouting for Boys serves up a wonderful hodge-podge of true crime stories, stern moralizing, stock adventure tales, natural history, first-aid tips, advice on observation and tracking, and much more. Readers will find a roughly composed pastiche of jingoist lore and tracker legend, padded with lengthy quotations from adventure fiction--from Rudyard Kipling and James Fenimore Cooper, to Alexander Dumas and Arthur Conan Doyle--and seamed through with the multiple anxieties of its time: fears of degeneration ("the fall of the Roman empire was due to bad citizenship") and a constant worry over imminent war. Alongside practical instructions on how to light fires, build a boat, or stalk animals (or men), it includes sections on chivalry, self-discipline, self-improvement, and citizenship. Indeed, the book brims with Baden-Powell's philosophy of life, one that replaces self with service, puts country before the individual, and duty above all. The introduction by Elleke Boehmer illuminates the book's maverick complexity and her notes clarify obscure references. Though almost a century old, Scouting for Boys continues to fascinate, surprise, and motivate readers today. It will delight anyone interested in popular culture, Victorian history, and literature for children. Elleke Boehmer is Hildred Carlile Professor in English at Royal Holloway, University of London. She is the author of many books and articles on postcolonial writing and theory. She has also written short stories and three novels, most recently Bloodlines.